“Political risk? SAD!” With the global economy continuing to grow steadily without evidence of a strong upsurge in inflation, recent market corrections have increasingly been driven by concerns about political developments. Whether these appear in the form of a tweet from the US President, BREXIT, regime change in Mexico, regime continuity in Turkey, populism in Italy or any other political threat to a local, regional or the global economy, market behaviour suggests that it is in these non-economic areas where the main risks to an investment portfolio currently lie. It may or may not be “sad”, certainly it is becoming more important to take political risk into account in portfolio management. This is a challenge for traditional market-risk metrics which typically rely on the fundamental attributes of securities and familiar macro-economic themes as the basis for risk estimation and attribution. Political factors appear hard to incorporate into conventional portfolio risk analysis because of the lack of market level traded data to capture them. Twenty years ago, the Eurasia Group was founded to provide political insights to the investment community and is now the global leader in political risk analysis with a reputation for geopolitical foresight. Along with a range of publications it expresses its insights in quantitative form through a set of five Political Risk Indices for each of 78 countries. 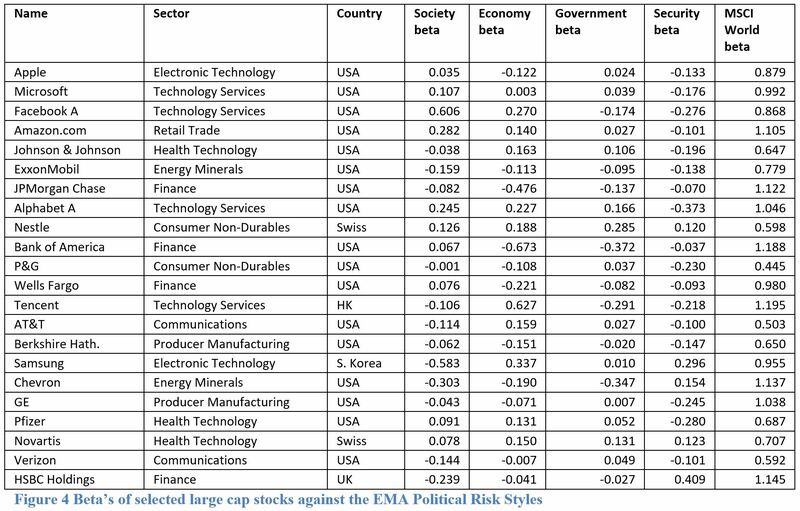 These indices categorise political risk under the headings of Security, Society, Government, and Economic and there is also a combined “Overall Political Stability” index (OPS). The quantitative indicators communicate a “score” at the country level but do not directly provide a measure of the relative attractiveness of market indices nor anything at the individual security level. Recognising that such finer measures of political risk were needed in order to fully integrate their added value into a portfolio construction process and for risk analysis, Eurasia has been working with EM Applications (EMA), to translate its scores into security level political risk sensitivity measures. EMA provides a range of factor models that can be used to estimate both the level of risk in an investment portfolio and its sources. The EMA factors are generated using a machine-learning algorithm (Expectation Maximisation – EM) that is widely used in the field of AI (Artificial Intelligence). The EM algorithm deduces the most relevant set of systematic factors without human input. The resulting models contain a set of factor loadings (sensitivities) for each security (a risk profile) and can be used for decision making. These loadings can be used to perform an instantaneous “Style Analysis” of a portfolio in accordance with regression techniques originally developed by Bill Sharpe to attribute portfolio risk to a set of defined investment themes. 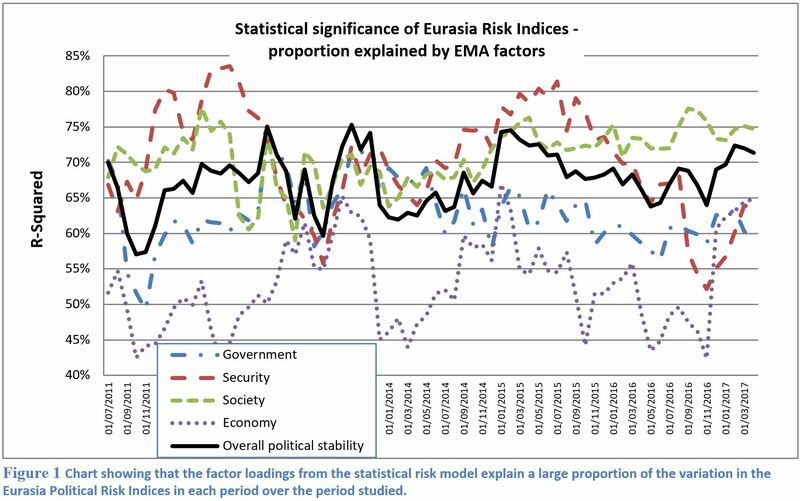 EMA first sought to confirm that the Eurasia political risk indices had a statistically significant relationship with observed systematic market factors. Working with a sample of the Eurasia Risk Indices between July 2011 and April 2017 comprising a score of between 1 and 100 for each of the 5 indices, EMA assigned an equity index to each country, for example the S&P500 was used to represent the USA. Each of the five political risk indices was then regressed against the EMA factor profile for each equity index. As shown in Figure 1, these tests showed that there was a statistically significant relationship between the indices and the respective factor profiles for all periods between 2011 and 2017, with the one slight exception being that the Economy factor was not significant in all periods. An investment “style” is a market time series index that represents a “macro” or other systematic phenomena. For example, a style could portray the investment return from a country (e.g. the S&P500 represents the US), a sector (e.g. financials), a key fixed income measure (e.g. US Treasury 10 year), a commodity (WTI) or an equity fundamental investment approach (e.g. “growth”). Armed with these representations of asset classes and investment methods, it is possible to estimate the degree to which a given investment manager tilts a portfolio towards or away from one of the defined measures. The Political Risk Styles were constructed by sorting countries in descending order for a given Eurasia index and building an equal-weighted portfolio where the long-only side comprised the top half of the universe and the shorts the bottom half. These portfolios have “holdings” in equity indexes that represent the individual countries for which there are Eurasia index scores. The resultant style indices represent possible investment strategies that would take advantage of the information contained in the Eurasia Risk indices. The use of the long/short approach helps to reduce the impact of global market moves and focuses on the difference in the performance of the high scoring vs low scoring countries. Using the EMA factor profiles of the components of each Political Risk Style basket a profile for each Eurasia risk index can be computed. With the profiles for all months the correlations between any asset and a Political Risk Style can be calculated through time. 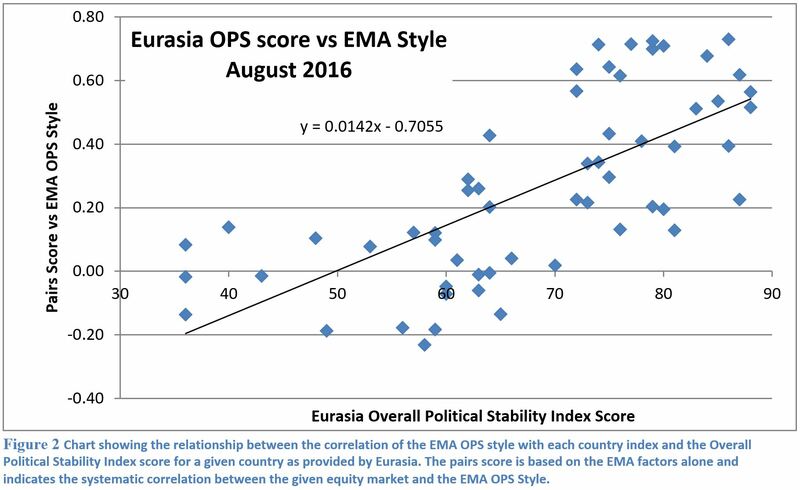 As an example test, the Eurasia Overall Political Stability (OPS) scores were mapped against the EMA Political Risk Style values as shown in Figure 2 below. As the chart illustrates, the EMA style exposures for the countries equity markets are positively correlated to the relevant country’s OPS Risk Index score; the higher the OPS score the more highly correlated that country index is with the EMA political risk style. These political risk styles, and the beta’s of any stock to those styles, can now be used to construct and analyse investment portfolios. In the example below an analysis has been made of an equal-weighted portfolio constructed of the largest 3000 global stocks by comparison with a cap-weighted benchmark constructed from the same universe. The analysis uses a style set constructed from the 4 component style indices and the MSCI World Index. The Overall Political Stability Index was not used in the style set because it is a linear combination of the other Risk Indices and not independent. 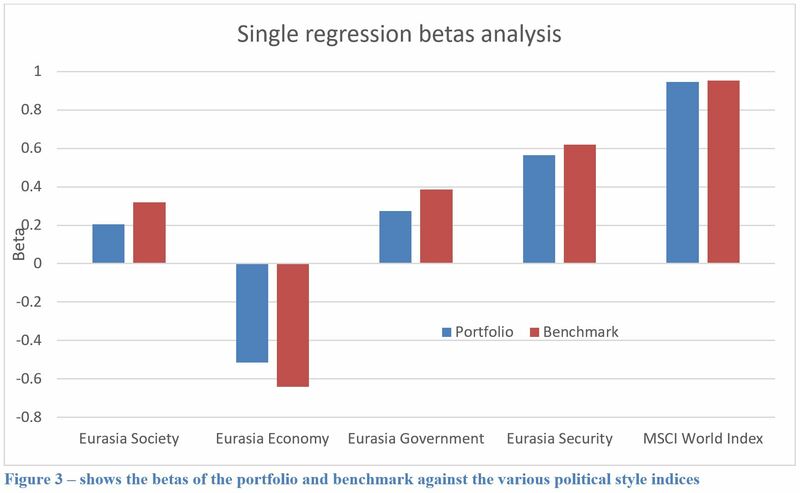 As shown in Figure 3, at the portfolio level, the aggregate beta’s against the different political risk styles are material and different from the benchmark. Eurasia’s Political Risk Indices are useful when considering how to allocate an investment portfolio between countries. By combining Eurasia’s scores for each country with the EMA Styles methodology produces asset-level measures of political risk. These values could be used by fund managers to help in making stock-level asset purchase and weighting decisions and to evaluate the political risk in an investment portfolio.